Laggard Rackspace growth sparks concern: is there enough cloud biz to go around? Here’s the narrative that cloud vendors would like us to believe: there are infinite workloads flowing to clouds of infinite capacity. There’s enough business for all, keep moving. But there is nagging worry, sparked anew by Rackspace’s laggard Q1 cloud growth, that the appetite for cloud services may not be unlimited after all. For its first quarter ending March 31, Rackspace(s rax)logged $91 million in public cloud revenue, up 4 percent sequentially and 40 percent year over year. It is the quarter-over-quarter number that has people spooked; given that Rackspace has been touting its new OpenStack public cloud, folks expected much better numbers. To be fair there are nuances about the Rackspace quarter to be examined. First, it blamed some of the inertia on price cuts on some services during the quarter. And the newer OpenStack-based public cloud business was up 75 percent sequentially, CEO Lanham Napier told analysts on the company earnings call Thursday night. The problem is demand for the older Slicehost-based cloud technology evaporated and bookings for the new cloud haven’t taken up the slack. New customers are being directed to the OpenStack option. There are Rackspace-specific issues but there are more macro concerns, which I’ll get to in a minute. Bryan McGrath, Rackspace’s director of finance, acknowledged that there may be vendor consolidation, just as there has been in other areas when technology matures. “There are lots of versions of Linux out there but only a few are widely adopted,” he noted. 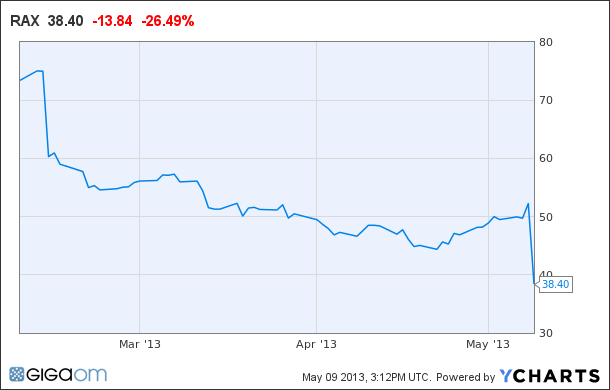 But his point is that even with consolidation, Rackspace is well positioned to prevail. After all, he noted, he company was able to build a $300 million business on its older cloud technology, which was admittedly less scalable and capable than giant Amazon(s amzn) Web Services. Of perhaps greater concern is that so many vendors are jumping into the cloud services game that there may not be enough customers to support them all. IBM will doubtless sell its OpenStack options as they come online to its typical Fortune 500 accounts, the biggest of the big companies. That leaves other smaller — yet still big companies — with OpenStack options from Hewlett-Packard(s hpq), Red Hat(s rhat), Rackspace and perhaps Dell, Cloudscaling, Nebula and other players going forward. Or they’ll go with CloudStack or Eucalyptus or OpenNebula clouds. Telcos, carriers and hosting companies are gearing up their own cloud services based on their own or partnering with aforementioned OpenStack or Joyent. Microsoft (S msft) just last month came online with its Azure IaaS option, which will probably get traction among the zillions of Windows shops. While Google(s goog) Compute Engine, which will probably become generally available next week at Google I/O, is not really seen as a business class public cloud, you’d be foolish to rule it out completely. And then there is the big, bad incumbent, AWS, which continues to churn out new services, price cuts and service options by the week. No matter what we make of Rackspace’s quarter, if you thought the cloud wars were hot before, you better gear up for the next round. The big question is whether there really is enough cloud work to support all these players going forward. Amazon.com CTO Werner Vogels, Rackspace President Lew Moorman and other cloud luminaries will no doubt map out this competitive landscape at GigaOM’s Structure event next month. I know why: Arrogance and immaturity. Why would I want to trust a provider who has a bunch of kids sliding down a play slide during my outage? Just youtube a video of ‘best place to work for+rackspace’. ~ unbelievable. Why would I care about fanatical support? I don’t want to even call in the first place! Why would I care about fanatical support when I don’t want to even call in the first place? I want self-service, automation, and reliability! Sorry Rackspace, but you’re still a ‘baby’. As someone who uses both clouds I believe Rackspace’s nascent growth is due to the fact that all of their offerings drive you to use Rackspace. Amazon’s offerings drive you to use the platform. There’s a huge difference in that. Rackspace is turning into VAAS (Vendor as a Service). What’s driving me increasingly into AWS is the innovation and flexibility. Rackspace has an “in” with their existing traditional hosting customers. But you have to ask yourself how many of them already are satisfied with a traditional model of computing. After all if they don’t even want to host their own infrastructure what’s the appetite for investing in the development effort needed to build cloud aware applications. This means that beyond their existing customers they have to appeal to the market you mentioned above. This is a competitive landscape. These organizations not only have to choose between vendors but platforms and strategies. Do they want to just extend their existing enterprise using vCloud or SCCM/Azure (one day). Or do they want to build a new delivery model all together. Once, this decision is made the next question is which platform/vendor. What’s the pool for this type of organization. Rackspace is probably the best option for an Openstack Cloud but what’s the market potential for OpenStack clouds? I agree this is what we are seeing in their results. What does “the open cloud company” even mean? I talked with a sales rep and they’re not binary compatible with OpenStack on my own infrastructure, so what do I gain by paying them and their marketing of “open cloud”? Their pricing isn’t that competitive, they don’t have the services of AWS and Azure and while they’re support is known to be fanatical, Amazon and Microsoft have certainly stepped up their game. Microsoft just announced Azure topped 1 billion in annual revenue, maybe the extension of the enterprise model into the cloud is a better concept than the build it on the cloud that Rackspace seems stuck on.